Shackles and Bones will embark on a regional tour spanning across three provinces namely; the Eastern Cape, KwaZulu-Natal and Gauteng to showcase their multi-faceted performance to a broad, new audience. The tour will take place over the period of three weeks in April during which the band will be performing nine uniquely curated shows. Playing in a variety of venues – Shackles and Bones will be able to showcase their dynamic ability to perform in small intimate venues as well as in large halls where dancing is a certainty. After a hugely successful tour of Vietnam in August of 2018, the band is looking to continue their intrepid musical journey through the distant corners of your imagination and comprehension. 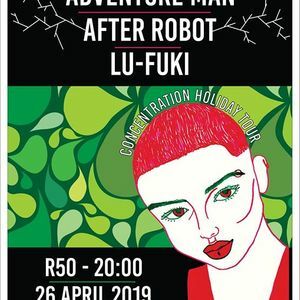 Join us for an intrepid night of music at Rumours Rock City featuring music from Adventure Man at 20:00, Lu-Fuki at 21:00, Shackles and Bones at 22:00 and After Robot at 23:00. Shackles and Bones is a band that revel in their ability to draw from multiple genres and influences to produce a sound that manifests a desire for genre fusion coupled with contemporary sounds. Lead singer and guitarist David Glover mixes funk-jazz chord progressions with sensual and soulful vocals, all while supported by the indestructibly groovy rhythm section comprised of Argentine born drummer Julián Arenzon and lion-person Steven Ellery on the bass. Shackles and Bones put on a dynamic performance that will surely have a little something for everybody. Movie under the Stars - Hop!